Scars are the permanent signs after the wound healing and persist after the wound has healed and remains for life long. Scar may be raised, depressed, different in colour or texture from surrounding tissue and may be noticeable due to its shape size or location. Poor healing contributes to move visible and disfiguring scar tissue. Elegance Laser Clinics - Service Provider of complexion improvement treatment service, anti aging treatment service Laser Skin Treatment Service. Radiosurgery is the latest technology where radio waves are used for treatment. LASER's would employ light energy while the radiosurgery would use radiowaves. Depending on the frequency and intensity of the waves, different effects can be achieved on the tissues. 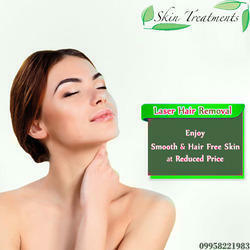 Dr.Parthasarathi is one of the leading skin care specialist in Bangalore offers affordable laser skin treatments. Every woman has a dream of retaining her young looks as no one wants to move around with wrinkles and sagging skin. The best doctor for laser hair removal, Delhi, India Dr. Ajaya Kashyap has the best laser hair removal, stretch mark freckles treatment in Delhi India at Medspa!